Full-day Pass. Lunch Included. Proof needed (eg. website link) to show that you are a start-up found...er. Get a stall. Full-day pass for 2-members of your team. Lunch Included. ID proof as an ex-BITSian nee...ded on the day of the event. Get a stall. Full-day pass for 2-members of your team. Lunch Included. Only if you are a BITS student. Login Through Your BITS Mail ID And Claim Full-day Pass. Lunch Inclu...ded. Entrepreneurship has arguably been the most widespread trend since the beginning of this century with many taking it up as a career inspired by the success stories of Silicon Valley. However, it is not something you learn through stories, it is something you learn only by experiencing. 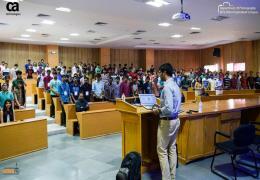 To live that experience come, witness LAUNCHPAD, the annual E-summit of BITS Pilani Hyderabad Campus. An enthralling event, it will be a platform for students, entrepreneurs, investors, corporates, and many more from various domains to come together and exchange knowledge on enterprising through a multitude of events ranging from panel discussions, B-Plan competitions, and much more! Note the date, its 18th February 2018.